Great sound from wireless, noise-cancelling headphones—the trifecta for private listening. A remarkable fifteen hours of use on a single charge is a welcome bonus. These headphones connect wirelessly to your phone via Bluetooth for tangle-free operation. Incoming phone calls pause your music for a true hands-free experience. The design and build quality are both first rate. Many headphones are big and obtrusive making the wearer feel conspicuous. These fit closer to your head and have a unified, monochromatic color scheme. The padded fabric headband is comfortable and the ear pads are soft and smooth. The phones fold flat when not in use but I’m surprised that high-end headphones like these do not include a case. Many competitors do, and at this price they should be part of the package. There is a cluster of small controls on the right earpiece: Power, Volume, Play/Pause, Bluetooth pairing, Phone Answer/Hang-up, plus two LEDs. You must train your fingers to use the controls with any accuracy. This can be accomplished, but it takes time. Attempting to quickly answer a call can result in accidental button presses. These phones are not featherweights but at 9 ounces (258g), they don’t feel heavy when in use. Active noise cancellation was pioneered by Bose and they still do it best, in my opinion. JBL’s process comes close, however. Although the headphones are wireless, a woven fabric cable is included with a play/pause/skip button for corded use. 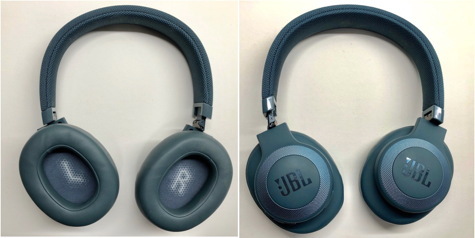 Noise cancellation can be activated in both wireless and wired modes. Expect up to 15 hours on a charge with noise cancellation on and an impressive 24 hours when off. A complete charge can take up to two hours but the phones keep their charge for days so usually a top-up is all that is required. 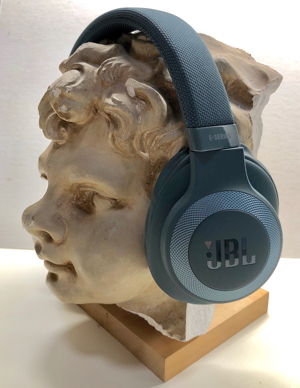 These headphones produce what JBL calls their Signature Sound. I like it, but its equalization profile has been shaped. The bass is increased a bit as with most popular headphones. The extreme high end has been crisped up while the midrange profile seems more natural. Overall the sound is pleasing with outstanding presence particularly with vocals. There are a number of tracks that I use frequently when evaluating audio. Solo piano (Keith Jarrett) sparkles, deep visceral bass produced by 40mm drivers can actually be felt, and good ol’ country guitar (Little Willies) will get you up stomping your feet. MyMac Reviews rating is 8 out of 10. Geekiest Show Ever 283 – Luck of the Irish?